Photograph courtesy Chris Donald. D5038 stands inside Crewe Works, September 18th 1971 with a breakdown train. This was one of several Class 24s to receive the two-tone green livery more often associated with Classes 25 & 47. After about half a dozen were repainted at Derby in 1965 the paintshop returned to painting the Class 24s in the solid Brunswick green. The sixteen year ten month career of 5037/24037 saw allocations to Eastern Region & London Midland Region depots. January 1960 to March (31B). June 1960 to Ipswich (32B). August 3rd 1975 stored serviceable. December 1975 - reinstated to Crewe. July 17th 1976 - withdrawn. 24038 was stored at Crewe from February 1976 until May 2nd 1977 when 24038/39/41/46 ran as the 06.50 Crewe-Oxford-Swindon. The consist spent sometime laying over at Oxford, departing from there on May 17th. By the third week of June 24038 had been broken up. Noted Stratford Works October 1961 (Heavy Intermediate). Noted resonably ex-works May 1963. Noted Derby Works March - July 1965 (Repaint two-tone green). Assumed Derby Works late 1972 / early 1973 (Repaint into blue livery). 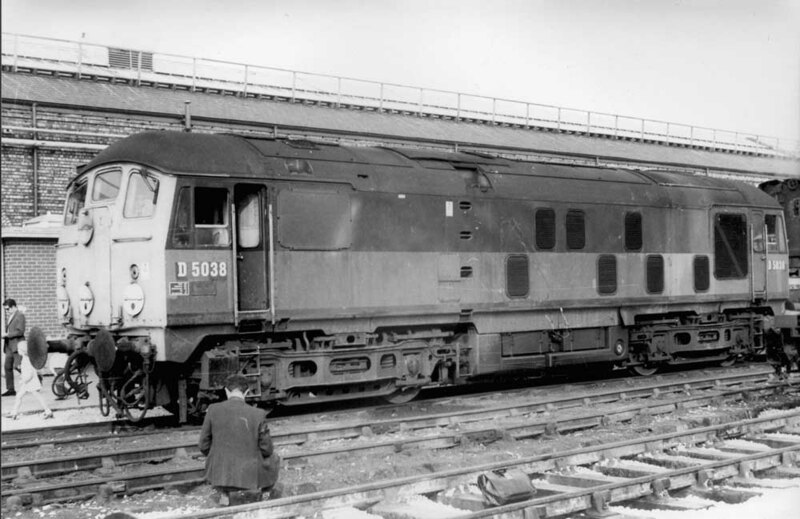 D5038 was one of a large batch built at Crewe Works and intended for the dieselisation program in East Anglia. D5038's first allocation was to March (32B) during August. During January a brief move was made to Ipswich (31B), by the end of June D5038 was back at March. Whitsun Bank holiday found a number of Type 2s visiting Southend with excursions from the north London area, so noted were D5032/38/44 & 77. Condition May (locomotive resonably ex-works): green livery with small yellow ends, curved upper corners, small gap between bottom of yellow panel and frame level stripe, full size fuel & water tanks, ridge sided sandboxes, two rung bogie mounted footsteps, gangway doors present, hand/footholds present, no blanking plates, cab roof ventilators present, all valencing present. 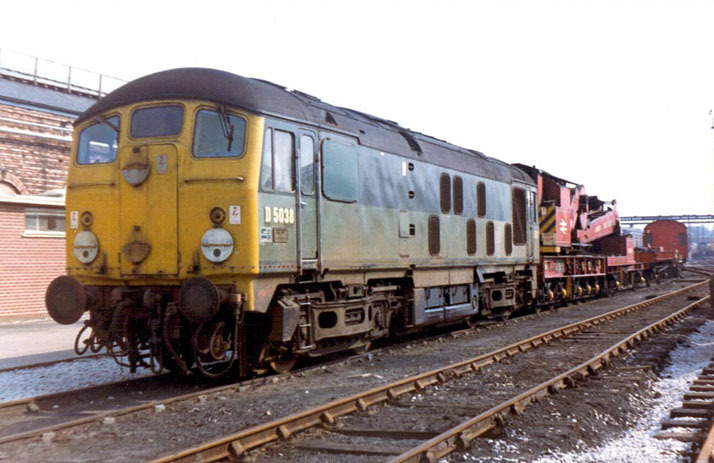 Condition July (ex-works from Derby): two-tone green livery with small yellow warning panels (similar to livery carried by D5233 onwards), red buffer beam, full size fuel & water tanks, straight sided sandboxes, two rung bogie mounted footsteps, gangway doors present, hand/footholds present, no blanking plates, cab roof ventilators sheeted over, all valencing present. After eight years on the Eastern Region, with the last six spent continuously at March it was time for D5038 to move on. During August it became one of the many Class 24s to move northward to the Stoke Division (D05), one of many locomotive reallocations that would push the diminishing LMR steam fleet towards its last stand, the North West area sheds. Condition July: two-tone green livery with full yellow ends, red buffer beam, full size fuel & water tanks, fuel tank fitted with circular gauge, ridge sided sandboxes, three rung bogie mounted footsteps, gangway doors present, hand/footholds present, blanking plates fitted, cab roof ventilators sheeted over, all valencing present. Photograph collection of webmaster. Another view of D5038 at Crewe Works on September 18th 1971, the date of that year's annual Open Day. Steam has been gone for three years now, but the diesel still carries its 'D' prefix. The fuel tank has gained a circular gauge and the 'Lion & Wheel' emblem has disappeared from the bodyside. Still carrying two-tone green livery during October 1972. 5038 was renumbered during the middle of February. With the WCML electrification complete, a continued reduction in local freight flows and the realisation that the Class 24s were in need of major refurbishment if there was even a reason to keep them around (none were train airbrake equipped), major withdrawals from service took place during the summer of 1975. 24038 was officially stored during August, one of many to congregate in the Crewe area. However 24038 and two others had a brief reprieve being reinstated during December to Crewe. 24038 was withdrawn on July 17th 1976. Condition final: blue/yellow livery, gangway doors sheeted over, full size fuel & water tanks, fuel tank fitted with circular gauge, ridge sided sandboxes, three rung bogie mounted footsteps, No.1 cab roof fitted with ventilators fitted - No.2 cab roof ventilators sheeted over, hand/footholds plated over, blanking plates fitted. 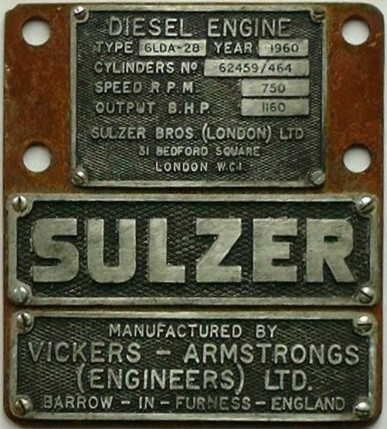 The engine detail plate attached to the last power unit carried by 24038.